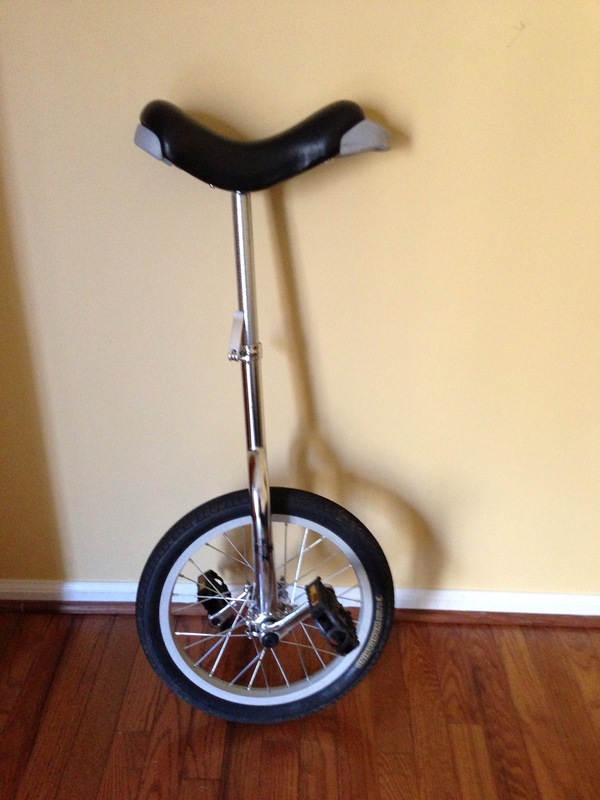 My 14-year-old son—I call him Taz online—is learning to ride a unicycle. Yes, really. After a few weekends of practice, he’s already pretty good at it. I’ve spent his whole life trying to teach him what I think he needs to know before he leaves home in just a few years—sniff, sniff—but I think there are some lessons I could learn from him too. 1. Be yourself. It’s okay to defy convention. Taz started his freshman year with atomic turquoise hair. It’s currently faded royal blue, and it’s been through iterations of purple and green in the last year or so. Teachers probably cringed when they saw him coming in his skinny jeans and Vans. But they were in for a pleasant surprise, because he’s a smarty. And his look doesn’t scream athlete either, but he’s that too. When he first told me he’d like to dye his hair, I said, “Go for it!” Hey, hair grows out, and you’re only a kid once. If not now, then when? When I was his age, I wanted to dye the ends of my hair blue, but never had the guts. I was too worried about what my friends and classmates would think. In my experience, when you let the opinion of others rule your actions, a little part of you dies. But when you overcome your fears and dare to be yourself, your self-confidence soars. I've seen that confidence in him, and what better way to start high school? It took me almost a year before I was willing to tell people outright that I was not only a writer, but—gasp!—I write romance, the best-selling, yet most maligned genre of fiction out there. But now that I’ve owned it, I’m much happier. Taz is a typical teenager who hates to clean his room, leaves little messes (dishes, food wrappers, school supplies, shoes) everywhere he goes, and loves video games. But he’s not a slacker by any means. Take the unicycle for example. He decided he wanted one, used a Christmas gift card to buy it, and has spent hours every weekend for the past several weeks mastering it. When he wants something, he goes after it, whether it’s a better grade, a faster race time, or a certain video game score. He’s learning over and over that the time he puts in pays off in the end. Writing is like that. Hell, life is like that. Nothing worthwhile comes without effort, whether it be a writing career, a new job, a degree, a good relationship, or a trim physique. 3. Sometimes it’s okay to quit. Okay, tenacity is good, but there’s something to be said for knowing when to hang it up too. Taz was a good swimmer. Maybe not future Olympian quality, but definitely competitive. He worked hard at practice and swam hard at meets. But the last year or so, he realized it wasn’t what he really wanted to be doing. Not only was he burned out by the schedule and expectations, but he had his heart set on running. We made him finish the season, because, well, we’d paid for it for one thing. And we wanted to make sure he wouldn’t regret quitting something he’d spent five years doing. But in the end, he decided to trade in his flippers for running shoes. So, don’t just stubbornly stick with something because you’re afraid of giving up. Spend time on those things that are truly your dream, and shed those that you’re doing out of a sense of obligation. Those are just a few things I’ve picked up from my son. As parents, we’re always thinking about how much we have to impart on our progeny, but both of my boys have taught me a lot about myself and the world. What lessons have you learned from a child? Have a super writing week! Thanks, Jolyse! I’m lucky to have two awesome teenagers (the other one’s a junior and gets annoyed because people are like, “Your brother’s the one with the blue hair?” 😉 ). Happy writing to you too! Great lessons for us all, Gwen. Your son sounds neat. I’m still trying to teach mine the value of sticking to something he wants. I especially like #1. I used to know this and am re-learning it in middle age, becoming less swayed by the conventional views of others, and closer to the real me. I personally Think post, “Lessons from my son | The Edited Life” sevenyearsgone was fantastic!